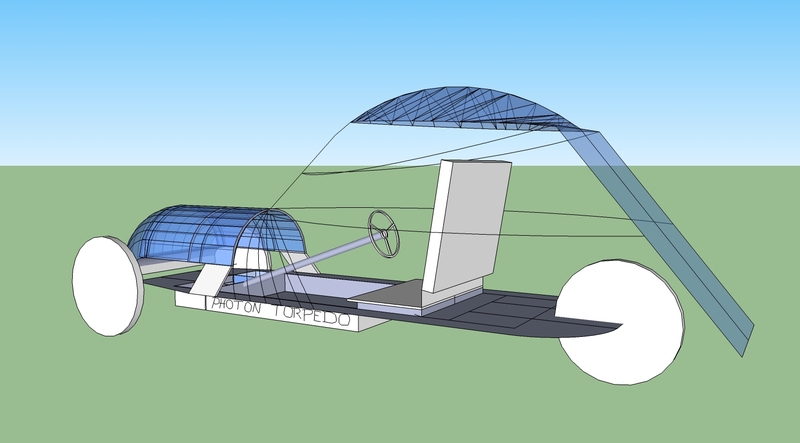 Photon Torpedo | A Solar Vehicle Project From Prince George, B.C. 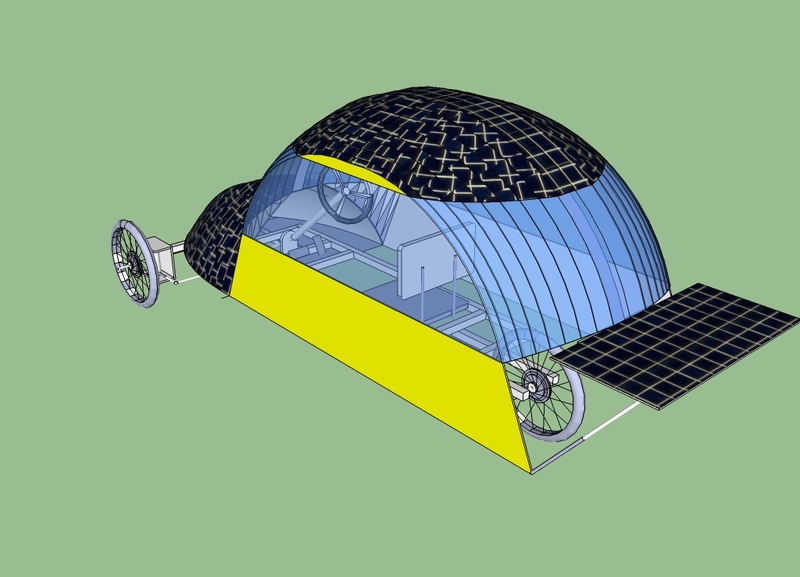 A Solar Vehicle Project From Prince George, B.C. These are the latest sketchup renditions, getting better at modeling those pesky round surfaces. The solar cells are black, and I’ve added a flip-up back panel, which might end up being larger but this would represent a minimalist version. Wish I could get the 3D viewer plug in for wordpress but as that has eluded me, for now screen shots will have to suffice. Here is a SketchUp screenshot that more accurately reflects a portion of what we are currently thinking. The vehicle sides are missing as they would clutter and block the view. 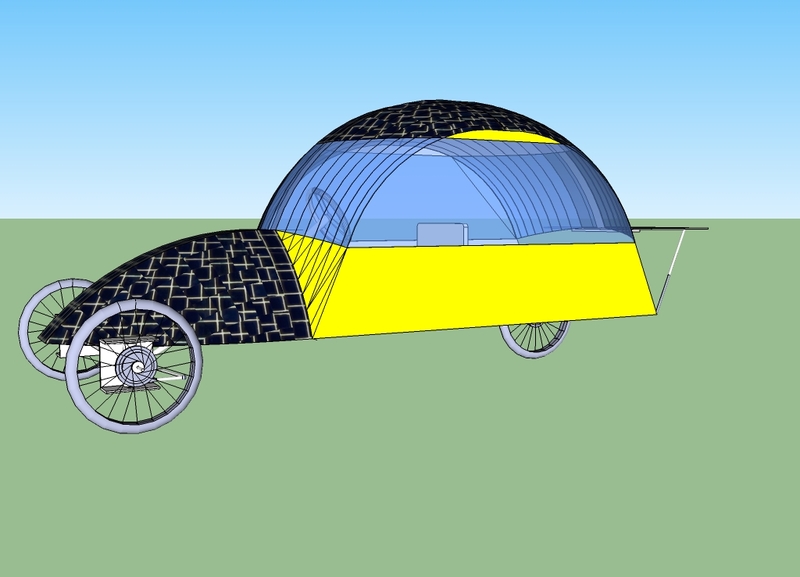 The design evolves with each bit of work we do, as will become apparent once we figure out which form our solar cells will take, how they will be attached, and how successful we are at making the Fibreglass shell we are dreaming of! 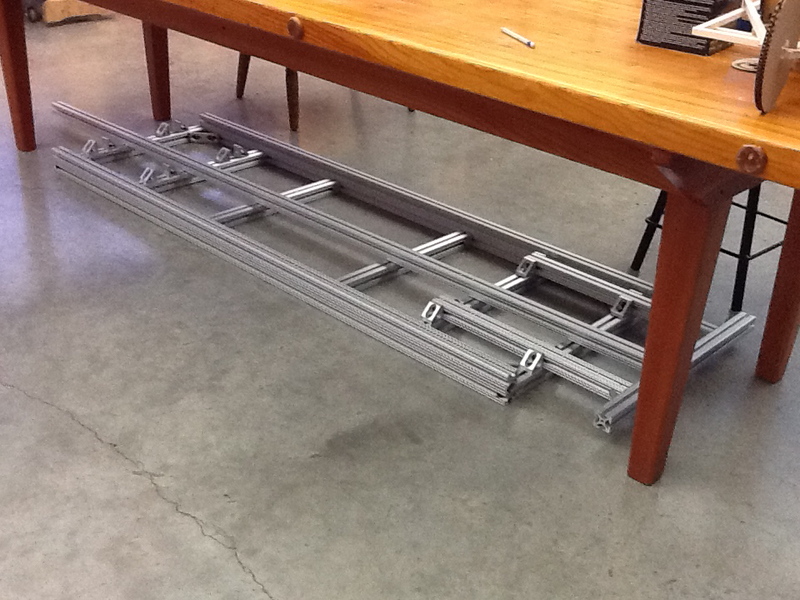 The wheels and frame are to scale, the rest is estimated for now. We purchased our aluminum T-slot and assembled it in June of 2015. Here it is partly assembled (but with an extra piece lying on top – the long piece in the middle) and occupying the only place we could find to store it, under a table. Spring 2015 got funding, thanks very much to efforts from the Two Rivers Gallery! 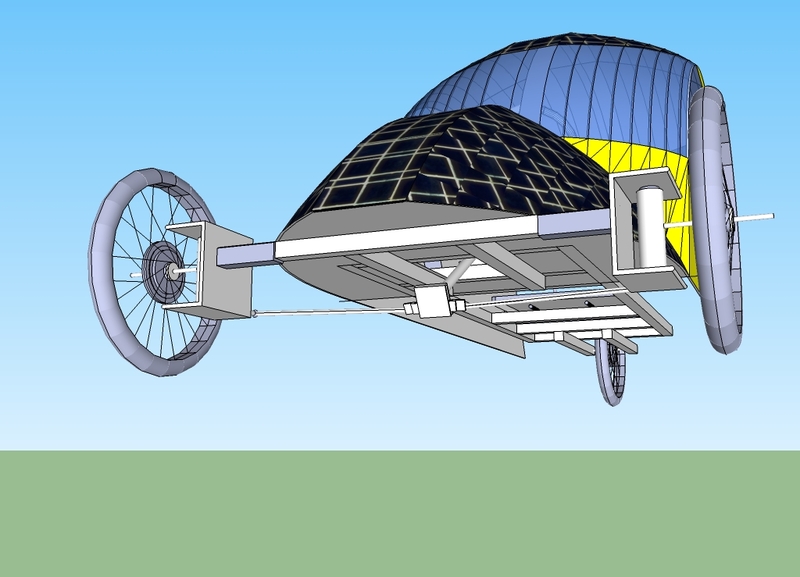 The “Photon Torpedo” is a solar electric vehicle built as a community project in Prince George, British Columbia. It is based in the Maker Lab at the Two Rivers Gallery, and will be an electric vehicle, built from scratch, that is powered by on-board solar panels. 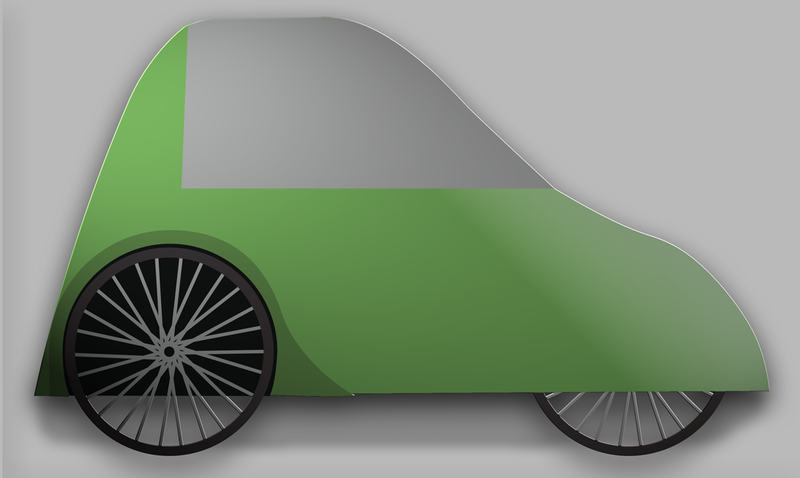 The early stages of planning have seen the evolution of a single occupant street legal low speed vehicle that has three wheels and can travel up to 30 kph with a range of 30 km. The goals of the project are to create awareness of energy issues, explore alternative energy options in the north, and to engage the community of Prince George in these issues. We plan to demonstrate that it is possible to operate a zero emission vehicle powered only by solar energy in Prince George. The project is providing an opportunity to bring the community together around a project that is enjoyable and helps us learn about alternative energy for mobile applications. Once built, the Photon Torpedo will be available for community and education based demonstrations. Look for it at future events in Prince George. Participation in the creation of the Photon Torpedo is open to all, and anyone with an interest is welcome to join the group that meets Thursday evenings at the Maker Lab in the gallery.